Enter your email address and receive the latest news and offers from Bloom Magic. You can unsubscribe at any time. Bloom Magic specialise in creating a one-of-a-kind experience with our freshly-cut luxury flowers for flower delivery in Dublin and Ireland. Located and operating from Dublin, we have carefully designed our intricate and lavish hand-tied bouquets to ensure they leave a lasting impression on the lucky recipient. 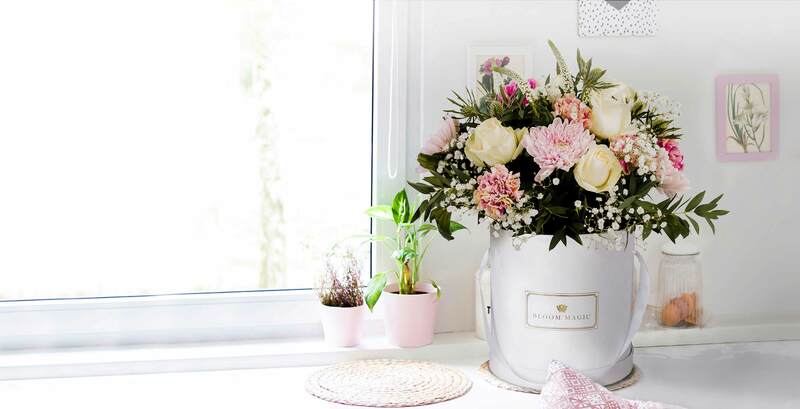 Our aim is to make it easier than ever before to send a thoughtful gift by combining luxurious bouquets with an unbeatable level of service with quality guaranteed. If you are looking for same-day flower delivery in Dublin, you are in luck! Bloom Magic offers guaranteed same-day delivery in Dublin. We deliver flowers in Dublin all throughout the week, including on Saturdays. It’s not just Dublin that gets a fast delivery, all of our bouquets and gifts are can be sent for next-day delivery throughout the whole of Ireland from Monday to Friday. Bloom Magic always comes first for premier flower delivery in Ireland. 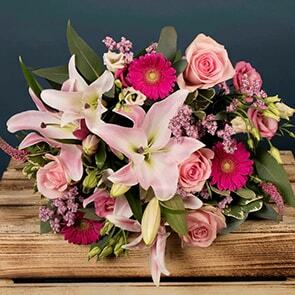 Whether you are in search of birthday flowers, thank you flowers, new baby flowers or get well flowers, Bloom Magic will ensure your gift arrives exactly when you need it to. Regardless of the occasion, all of our bouquets are thoughtfully created exclusively for Bloom Magic, with quality and a breath-taking presentation at the forefront of our artisan Dublin florists’ minds. We take great pride in our consistent attention to detail in order to guarantee that your flower delivery in Ireland will have maximum impact on the recipient. We also believe in conservation and being kind to our planet. 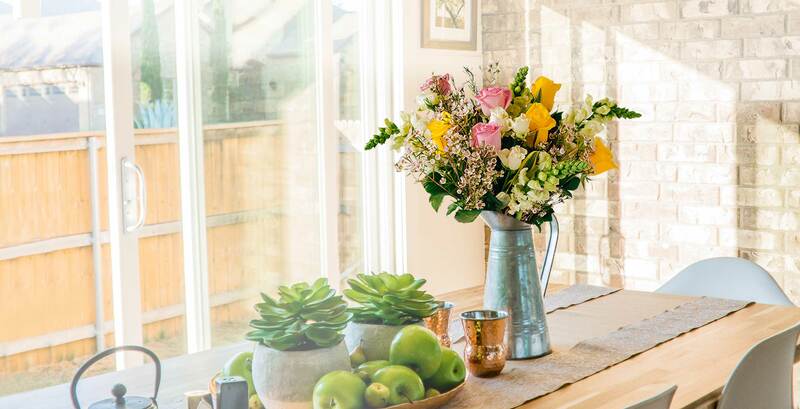 Bloom Magic are committed to utilising locally-sourced flowers whenever possible and ensure that each hand-tied bouquet displays beautifully upon arrival without the need for excess packaging. This attention to detail assures the flowers wow your loved one whilst remaining kind to the environment. At Bloom Magic, we also realise that sometimes you want to take your bouquet to the next level to really make a great impression. This is why we offer various upgrades and additional goodies for each order. Do you want to add a bit more oomph to your bouquet? Consider upgrading to our Premium or Deluxe sized bouquets. You can also add one of our elegant hourglass or classic cylinder vases to make your present just that little bit extra special. 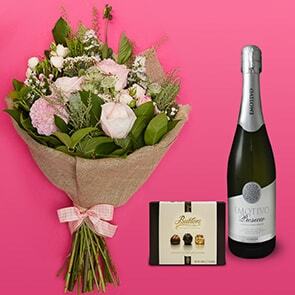 Not only does Bloom Magic offer same-day flower delivery in Dublin, we also offer a range of gifts for same-day delivery. How about adding a mouth-watering box of chocolates to your flowers? Or welcome the new addition to the family with a cuddly teddy bear? For proper congratulations or well wishes, add a bottle of champagne, wine, or prosecco. If you can’t quite decide, we have various gift sets available to give your loved one a special selection of goodies. Looking for flower delivery outside of Dublin? We deliver flowers to anywhere in Ireland, including to Cork, Limerick, Kilkenny, Belfast, Navan, Drogheda, Galway, Wexford and Waterford. 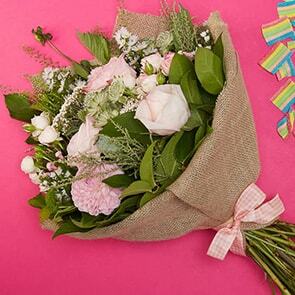 So, whatever the occasion, let us add a little bit of magic to someone else’s day with our luxury flowers and gifts. It’s our pleasure.